Home Shows UK In Hand Awards – the Winners! The UK In Hand Awards is now in its 6th year now and still completely free to enter. 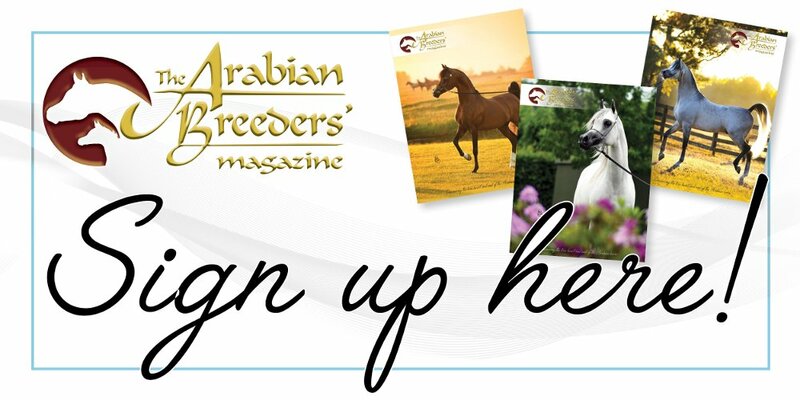 This scheme is open to any registered purebred, part-bred/Anglo, or high-percentage bred horse who is also a member of the Arab Horse Society. With three separate sections – purebred, part bred/Anglo, high-percentage bred – this is a year-long competition running from 1 June to 31 May. Entrants collate points for every placing their horses achieve in any in-hand class, at any show in the UK. 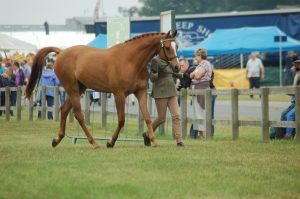 Different shows receive different points levels, as laid out in the rules, and the horse accumulates points throughout the year with the cards submitted by the closing date. 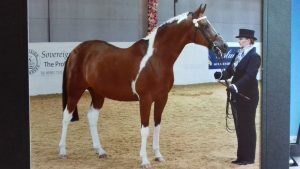 The top six in each category are awarded with garlands for the Gold, Silver and Bronze Champions and sashes for fourth to sixth, which are then presented at the National Arabian Championships at Malvern in July. There have been some incredible horse winning these awards, and the Gold Champions also receive a perpetual trophy where they can add their horses name. The awards are well supported and this year’s sponsors sees AV Arabians sponsoring the Pure-bred Champion garlands, which will be purple or course! Legacy Stud are sponsoring High Percentage Champion garlands, with Charlotte England Homes sponsoring the Anglo/Part-bred Champion garlands. The Norfolk & Suffolk Arabian Horse Group has kindly sponsored all the sashes in each section; in fact, many of the horses winning the awards this season showed successfully at this group’s show! There are also fabulous, huge high-point achiever rosettes to be won. There really is no reason why anyone showing their Arab should not enter. 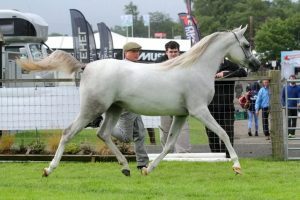 To enjoy a lap of honour in The Arabian Magazine main ring at the British Nationals is really something many cherish! Thanks must be given to the British Nationals Show Team and the Arab Horse Society for allowing these awards to be presented in the main ring at the show. Ravels Picasso, part-bred high percentage Arab gelding. Second consecutive win of the UK In Hand Gold High Percentage Champion. Multiple county and national wins and championships since his show career started after a novice endurance season. 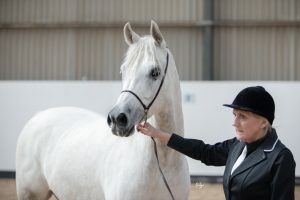 He is also ridden, having been placed in the AHS Performance Awards each year entered, alongside many other group and National Society yearly performance awards. Handler/rider/owner Erica Winn. My horse of a lifetime who has achieved so much. Had an amazing season last year, achieving my first British National Championship, and is currently enjoying a well-earned rest. I have owned Future Inferno, or Harn as he is known at home, since he was two years old. He is my first part-bred Arabian and has certainly made me a huge fan of the breed. Bred by Julia Hodkin of Future Sport Horses, he is by H Tobago out of Future Illicit Affair. We have had a great season, a highlight of which was the super results gained at the Norfolk & Suffolk Arabian Horse Group Show where he picked up two championships and stood Reserve In-hand Supreme. Harn is a joy to own and I’m so proud of what he has achieved so far. This is the second year we have taken part in the UK In Hands Awards, which is such a great scheme. To have placed again and done one better than last year is fantastic! We are so pleased to have achieved this award with one of our first homebreds. She has only been shown lightly but has been very successful in the shows she has attended. We will continue with her in-hand career. 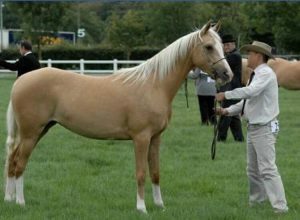 Zaina Bint Mia, ‘Grace’, is by Audemars PA and out of our Res British National Champion homebred mare Mia Bint Adala (by WH Justice). Grace has already won numerous championships at local, county and regional level. She was the result of a diamond breeding purchased in 2013. She is half-sister to our homebred Audella Rose, who won the gold UK In Hand award in 2017. Aja Benraz, ‘Ben’, is by WH Justice and out of Aja Beneja. 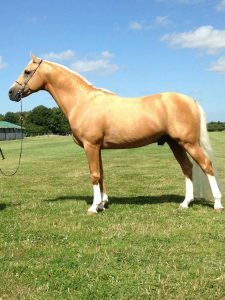 Bred by Mrs and Mrs Hickford, he was purchased in September 2015 from Mr and Mrs Robinsonfor my daughter, Michaela Brand. He is full brother to All Nations’ Cup Champion Aja Angelo. He competes in-hand and under saddle. 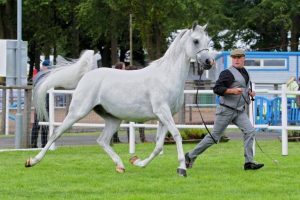 We are proud to compete at local, county and C show level as well as the British National Championships and the UK International Arabian Horse Show to help promote the breed both in-hand and under saddle. Reeme was bought for me after 30 years of not having Arabians, due to three young children and working shifts, but I always had a love for the Arabian horse. So, for my 60th birthday, all the family got me Reeme, a beautiful four-month old colt I fell in love with. At long last, with time and some money, I had the Arab of my dreams. Now a four-year old gelding, he is by the stunning HT Karachi out of the beautiful mare Strinesdale Fantasy from the Strinesdale Stud. We have done lots of shows – both Arab and local, county, Pony Club and NCPA shows. I am over the moon at getting this award. You don’t have to have 100% Arab knowledge, own an Arab stud farm, or be an Olympic runner; first or last, just keep going and love your little Arabian with all your heart. Thank you so much for my best award ever. Known as ‘Taz’ at home and to his friends, each year has got better and better with him, with last year being his most prolific season. 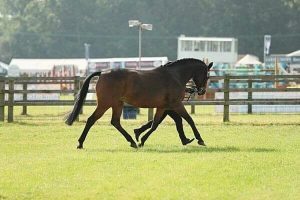 Just a few to mention are wins and Reserve British National Championships as well as wins and championships at the Northen Show and the British Arabian Championships northern, as well as Reserve North West Champion Part-bred Arab. The list goes on. 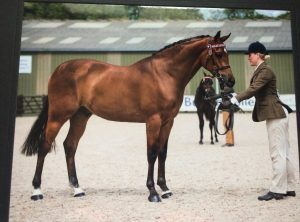 But after a hard winter, as most will know, he came out in 2018 for his debut in the ridden and did me proud, winning his pre-novice class and taking the in-hand and the Part-bred/Anglo section championship. I still believe that the best is yet to come with this special boy, and I’m proud to say I did it all myself – amateur and home-produced. Palila, known at home as ‘Prudence’, was bred by the Honourable Finn Guinness. She was born in April 2013, and I bought her in September 2016, having been lightly backed. Despite having the potential to be typically fiery, she has actually been the easiest horse to be around. She began the season last year a little nervous and very strong in-hand, but she quickly became most placid horse to take out. I have really taken my time with her and have been doing walk-trot dressage tests over the winter, and she coming is coming out with scores consistently over 65%. 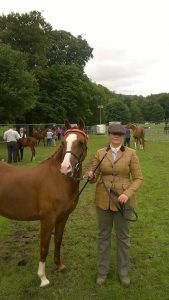 I have entered my first ridden classes this year, with the first being at the South East AHG Summer Show. I am eternally grateful to Mandy Burr who is responsible for keeping Pru in tip top condition, and also for sharing her wealth of knowledge and experience to help me keep on track with Pru’s education. Molly is a homebred 14-year old straight Arab/Thoroughbred cross. She is by Ashtaris, who was 84% Crabbet. 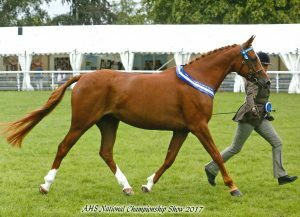 Molly was Senior Female Anglo British National Champion in 2013 and also took the Supreme in the UK Anglo and Part-bred classes at Malvern that year. Miss Petal came to me three years ago and was gifted to me from Amanda Sarsam. Miss Petal is a retired broodmare and now enjoying a second career as a show pony. This year, she is being campaigned as a veteran, as she is now 15-years old.